Thread: Help! WTH IS THIS? OK, please tell me someone knows what these are. I saw what looked like dust on the leaves and took a look with the scope. Ick.. I agree with AND. Definitly looks like fungus gnat larvae. That is the first time I have seen them on leaves. I usually see them in the soil. Very strange. I wonder if these are some form of catipilar. Am I seeing little legs on these? 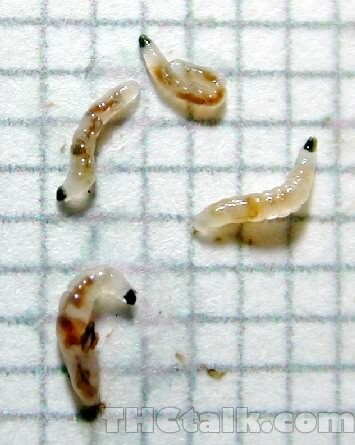 Fungus gnat larvae don't have legs as far as I know. they do look similar but slightly cleaner? Right on ggotch! 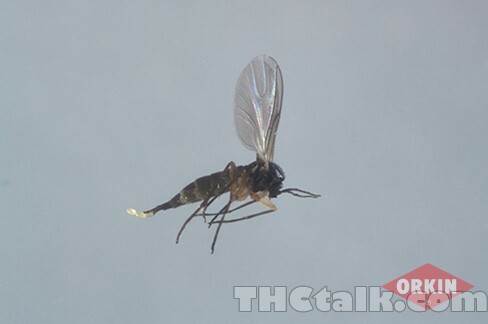 According to a researcher at the university of Vermont, fungus gnat larvae is always clear enough that you can see the food channels and they live in soil. It may help to note that I live in the desert. Humidity in my grow area floats between 15% an 35% RH. and they do appear to have legs. Definitely catapillars.. Now to identify them. Is that yellow or white? Possibly these? I looked into those... They are about 30x too big. Take a look at the pic below.. That leaf that it's on is about the size of a quarter. Honestly could be the oakworm dude. If those caterpillars just hatched, they would be very small.